My swab sampling kit was delivered today. Anyone else taken the plunge? If so, any success? Probably should've asked before pulling the trigger, but it received glowing Trustpilot reviews and I couldn't resist the lure of a few marginal gains. Will report back after my results are available and I've had my consultations. Bit of a similar tangent, but I did the Ancestry DNA thing in November and it was pants. Sparse and unsurprising info returned (did find out I was 3% French though?!) and got one message from a Canadian who might have been a 3rd or 4th cousin - didn't reply. Got my results today (took longer that it should've as I sent the swab back incorrectly the first time - 'doh!) and have attached a summary infographic .pdf so you can have a gander. There's loads of in depth reports with recommendations accessible on the website/app. Just need to book 30min consultations with a dietician and sports scientist now to discuss them. There's even a nice feature to see how your results compare to those of Olympians. Pretty happy with what I got for the outlay. How much did it cost? 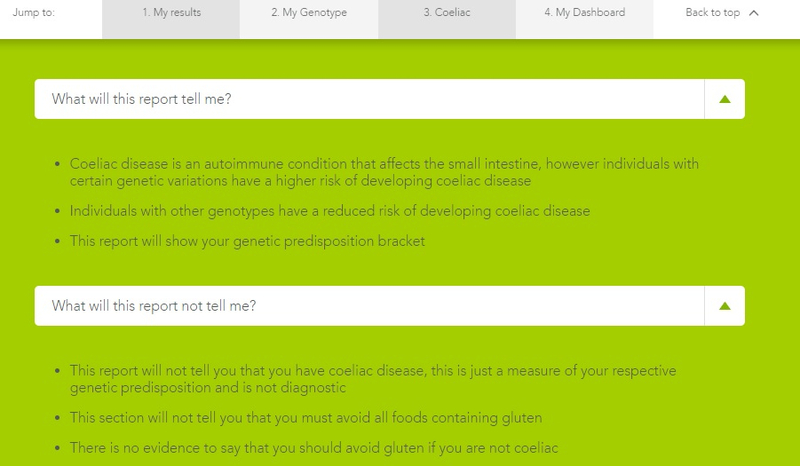 My husband is Coeliac, and I'd like to know whether the kids have inherited the gene responsible. If something like this could give an indication, it'd be pretty useful. That's really useful Ynnec, thanks. We know that because hubby has it, their chances of also having the gene are (obviously) higher than the average population (1 in 10, versus 1 in 100) so it would be good to know one way or the other if they were likely to develop CD in later life.